The City's Consultants, Brook McIlroy Inc./Pace Architects have completed the final draft plan for the Waterfront Parks Strategy, following previous public input sessions. Council approved the report on March 26, 2008. 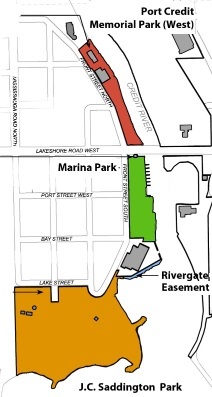 For information on the 3 priority parks in Port Credit, click on Port Credit Memorial Park West, Marina Park, and J.C. Saddington Park. Click here to access the WPS Report on the City's website. The winter of 2007/08 had more snowfall than the previous two years combined, and the issue of plowing public pathways has become all the more urgent for pedestrians who wish to maintain a healthy lifestyle year-round by enjoying the Waterfront Trail and walking to local shops. Starting with Winter 2008/09 there was snow plowing of public paths in the Waterfront Parks and over the Lakeshore Pedestrian Bridge at the Credit River, as TOPCA and so many residents and visitors have requested.